From the Hancock County Courthouse, go east 2 blocks (0.2 mile) to Boland Street. Turn right on Boland Street (which eventually becomes Linton Rd) and go about 8-1/2 miles to the Linton - Beulah Highway split. Continue left on Linton Rd for 5.3 miles. Go across a bridge and almost immediately to your left will be a short driveway to the cemetery. Darien Church was founded in 1794 on Buffalo Creek in the borderline area between Washington County and Hancock County, Georgia. Many of the earliest burials of its members occurred in the Linton Cemetery or local family cemeteries. In 1852, the church decided to build a 40 by 60 foot meeting house at this location (see Darien Baptist Church Records, Nov 6, 1852, p. 84). During its early years the church included both black and white members. In 1869, after emancipation, most of the black members left Darien Church and began their own church at Second Darien. Therefore it is possible that both black and white burials occurred in this cemetery between 1852 and 1869. Burials of white members of the church continue to this day in the cemetery, which is still owned by the church. Ga PFC 202 Ord. Dep. Co. Infant d/o Mr. & Mrs. Quincy Osborne. [w/o Luther Sanders, per Glen Cook] Birth month and day, death month and day per Glen Cook. Only years on gravestone. d/o Mr. & Mrs. L. Sanders. "He is a kind and loving son and affectionate brother"
"Safely in the arms of Jesus"
Inf. of Mr. & Mrs. W. H. Osborne, per Kimbrough list. 3 graves each marked with a rock headstone. Aged 2 Years. "Too pure and fair for aught on earth, This child was lent, not given. He came to show an angel forth. Then winged his way to heaven." 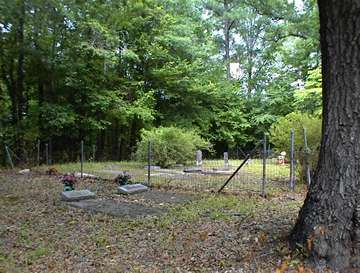 At one time there were 25-30 graves outside the fence, but there is no longer any trace of those graves, per Glen Cook. All of the following may be buried in unmarked graves. Donated land for church. Had a marker here at one time, per Saralyn Kimsey. Believed to be buried somewhere in this cemetery, per Raymond Garner. w/o Joe Miller. Believed to be buried somewhere in this cemetery, per Raymond Garner. w/o Burl Crooms. Believed to be buried somewhere in this cemetery, per Raymond Garner. w/o David Dowd. Believed to be buried somewhere in this cemetery, per Raymond Garner. Believed to be buried somewhere in this cemetery, per Glen Cook. Marker to be placed 2004. Believed to be buried somewhere in this cemetery, per Glen Cook. Infantry, Army of Tennessee. Dekalb Co.
Ga. All info per Glen Cook. w/o James Wilson Turner. Marker to be placed 2004. Believed to be buried somewhere in this cemetery, per Glen Cook.